Living in Dubai surely is bittersweet experience. As on one side expats are mesmerised by the glam of this city, and on the other hand, they’re trying to stretch every Dirham while fighting the tempting Friday brunches! But not all family activities have to be expensive in Dubai. If you look hard enough, you can find not even budget-friendly family activities, but absolutely free of charge! To help you out, we gathered a list of 5 family activities in Dubai you can enjoy for free! Since the weather is finally cooling down, take the kids out for a bike ride at the bike track near Nad Al Sheba. 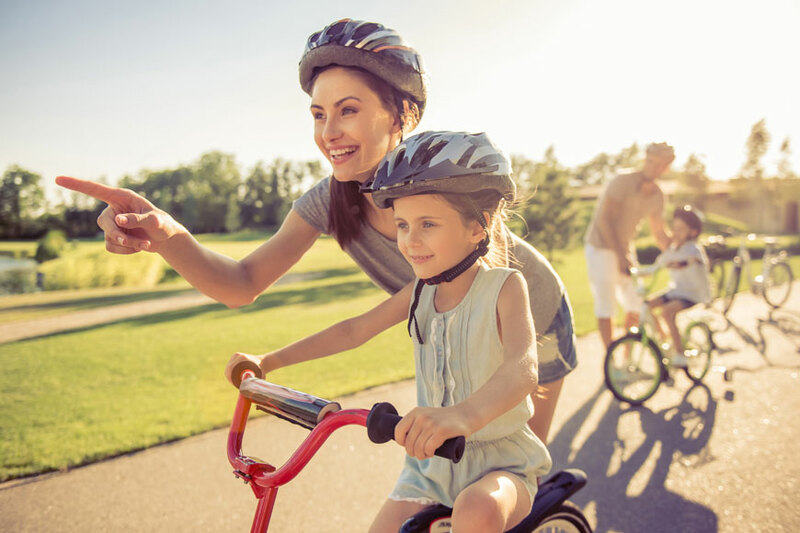 This cycle park is the perfect place for all ages, as it has an 850 metre children’s course, and a track for the older ones ages between 4-14, with speed bumps, street signs, and roundabouts. This family activity is both educational and loads of fun at the same time! You might think that a movie under the stars experience is far away from the desert city, but Dubai can never run out of surprises! Chill out with the family at the Pyramids Rooftop Gardens at Wafi Mall while watching a movie and munching on your homemade popcorn and hotdogs! The shows does run a little late starting at 8:30 pm, but you can always make this a weekend activity. In our opinion, it never gets old! Head to the Dubai Mall, preferably on a weekday, and enjoy a show from the largest dancing fountain in the world. Best part is: you can never miss it. As a different show runs every half an hour starting 6-11 pm, with two afternoon shows at 1 and 1:30 pm. If you’re heading to the Dubai Mall for the fountains, how about you pass by the Aquarium and the dinosaur while you’re at it. We know entering the aquarium isn’t for free, but you don’t really have to go in to enjoy a fishy experience! You can head afterwards to the Souk area where a genuine female Diplodocus skeleton stands tall. This is a great opportunity to make your trip to the Dubai Mall educational and fun. Safaris are a lot of fun, we know that. But they don’t always have to be costly. Pack your meals at home, take out the tipis, and head to the desert for a family bonding night under the stars. It can’t get better now that the weather is cooling down.